What rod will you pair with a TwinPower 6000 PG reel? Anyone have a similar setup? Where will you be using this setup at and for what type of fishing? Any budget? For jigging/bottom. 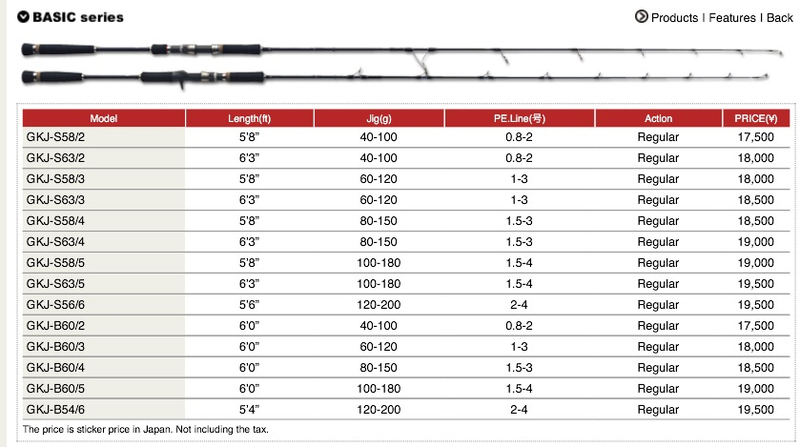 I saw megabass rod $400++ looks good to me but my friend ask me buy majorcraft giant killing. Burpp wrote: For jigging/bottom. I saw megabass rod $400++ looks good to me but my friend ask me buy majorcraft giant killing. I'm also in the market looking for a new rod to match my new reel. I had a few considerations when I choose my rods. 1. It had to be light especially if you are holding the rod for a period of time. 2. Must be able to match my reel. I will bring my reel a long to match the new rod. To me the top must not be too heavy. 3. Strong backbone If you use more for bottom I would suggest you go for one that has a strong backbone to yank the fish out of the hole. You don't want to have one that's too soft until you can't set the hook. 4. Length. For easier transport. 5. Jig weight. You may want to consider one that can handle up to 250g. For bottom I would consider one that can handle a size 8 sinker. Take a look at the spec of the giant killing may not be what you are looking for. I would suggest you go for the Alexander. Actually I would go for the Stella 5k pg. Expensive but it's well worth it. The Stella 5k pg is good enough for this region. I would also match the reel with the Alexander. It's like a perfect match. I just got a Twinpower 5000pg from a kaki, If i pair it with a GiantKilling PE2-4 ? Burpp wrote: I just got a Twinpower 5000pg from a kaki, If i pair it with a GiantKilling PE2-4 ? As mentioned the giant killing more like for light jigging. I would match it for a smaller reel 3k or 2.5k. But for a 5k reel the Alexander will be a better choice. Suggest bring your reel down to the tackle shop and feel for yourself. For me I'm more comfortable till pe 5 as I want to bring the rod for overseas fishing. Cheers.